I always wanted to be an artist. I went to school, studied art, fell in love, got married, and started a flourishing career publishing my work and receiving recognition with a few awards. That all changed in 2008, when I fell on a piece of ice, broke my arm and tore the muscle in my forearm that controls hand movement. That all changed in 2008, when I fell on a piece of ice, broke my arm and tore the muscle in my forearm that controls hand movement. I was in tremendous pain for many, many months. As my injuries healed, I was still left with a lot of residual pain and my quality of life hit a low point. I couldn’t paint, sculpt or carve. I kept dropping my tools and it was difficult for me to work on a computer. My days as an artist were over, and my skillset was dwindling. I tried everything. Physical therapy had minimal effects. An orthopedic surgeon treated me with shots for short-term pain relief, but I still couldn’t lift anything. That’s when I was referred to a physician anesthesiologist. Pain specialist and physician anesthesiologist Ashraf Razzak, M.D. reviewed my medical records, issued new MRIs and a study to evaluate the function of my nerves. He then created a pain management plan for me. Dr. Razzak identified a bulging disc in my neck that was putting pressure on my spinal cord and causing numbness and weakness in my right arm. On my second visit, Dr. Razzak gave me a spinal epidural injection, whichhe inserted directly into the bulging disc. The relief was nearly instantaneous. I felt like I could move freely in my body for the first time in years. Dr. Razzak’s epidural treatment plan spanned two months. After two more epidural injections, I regained more strength in my hand and the pain was almost completely gone. Two years later, I produced an award-winning painting. 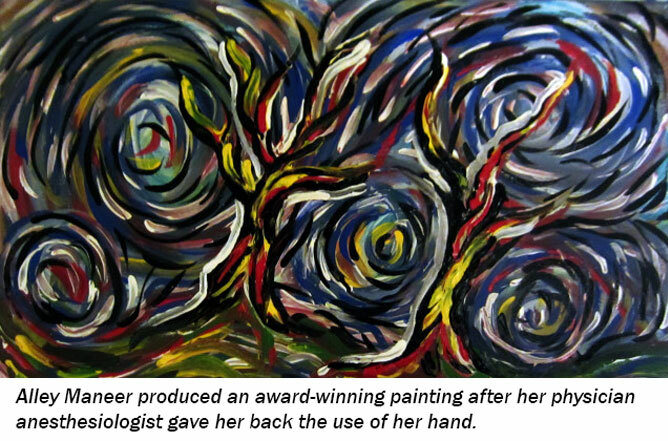 My physician anesthesiologist gave me back my hand, my life and my passion. Because of his expertise in pain management, I can do what I love again.